The Ewing women share a girls’ night out. Sue Ellen finds herself in a familiar predicament when John Ross strikes back at his family for derailing his attempts to frack on Southfork in order to fund Ewing Global’s big arctic lease deal. However, John Ross had better keep an eye out for Nicolas and Elena who have plans to turn him and Pamela against the rest of the family in a divide-and-conquer strategy to get Cliff Barnes off for J.R.’s murder. The first step in their plan is to cozy up to the Ewings with a night out on the town. Over drinks at a nightclub, Nicolas pretends to be tiring of doing Cliff’s bidding in order to forge a connection with John Ross, who takes the bait. Elena, meanwhile, works on Pamela’s insecurities about John Ross’ trashy secretary Candace during a girls’ night out that includes Emma. John Ross would never cheat on her with Candace, Elena assures Pam as Emma agrees with a knowing glint in her eye. John Ross finds inspiration when he spots Hunter McKay, the grandson of J.R.’s old enemy Carter McKay, celebrating the public offering of his digital media company. An IPO of Ewing Global might just be the thing to raise funds for the arctic deal, John Ross decides and moves to put his new plan in motion. He convinces Sue Ellen that his fling with Emma is over and gets her support for an IPO. His offer to Nicolas of two percent of the royalties from the arctic lease deal gets the cooperation of Mr. Trevino, who secretly relishes the prospect of buying up Ewing Global shares for himself. Just like J.R., however, John Ross’ progress gets complicated by scheming women in his orbit. Candace, under pressure from Harris to get John Ross’ seed on the “Lewinsky” dress, makes an overt after-hours pass at her boss at the office despite having failed to tempt him at the nightclub. John Ross turns her down again but this time Sue Ellen catches her leaving his office half-dressed and Candace does nothing to correct Sue Ellen’s assumption that her son is a cheater like his father was after all. In Christopher’s surprisingly boring storyline, Bo dumps his and Heather’s little boy at the ranch when he gets an unexpected gig and Christopher volunteers to take the tyke to work with him so Heather can do her job. We learn that Bo is a former rodeo champ embittered by an accident that ended his career. Yawn. 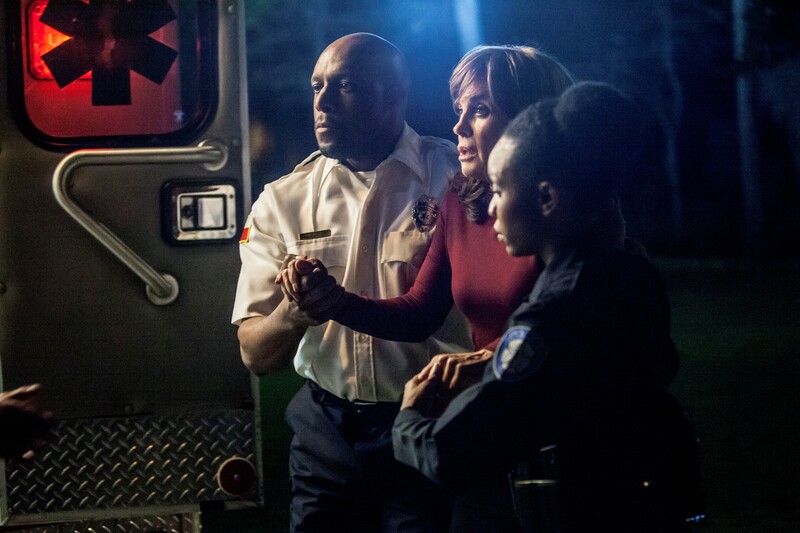 Sue Ellen flashes back to the ’70s when John Ross, like J.R., has her hauled away for psychiatric evaluation. During a showdown over the IPO vote with Bobby and Christopher at Ewing Global, John Ross is shocked to again be betrayed by his mother, who refuses to vote with him despite having promised to do so. After he confronts her, she tells him she spotted Candace leaving his office and rages at him for lying to her. John Ross decides to use Sue Ellen’s drinking against her. Taking a page from the old J.R. play book, he turns to Emma for some blackmail material from her endless supply of evidence taken at the Rylands’ terribly convenient whorehouse to get leverage against an official to help him deal with his uncooperative mother. Emma, however, is feeling especially demanding and exacts a favor of her own from John Ross. In one of the show’s most daring scenes to date, she tells him not to bother removing his clothes since his mouth is the only thing he’ll need to pay her price for the information. Elena, who had hired a detective to plant cameras throughout John Ross’ office space, is shocked to witness the deed, realizing her suspicions about John Ross’ infidelity were right all along. Nicolas’ quest for leverage against Mr. Ewing has hit the jackpot! For now, John Ross is enjoying his triumph, getting his mother carted away for psychiatric evaluation in a drunken stupor and lowering the boom on Bobby and Christopher. He has control of Sue Ellen’s voting shares and there’s not a damned thing they can do about it!